he Super Jar is an upscale take on the standard canning jar, offering the versatility of a rounded shape and Le Parfait's clean design. With the solid, easy construction of a hinged, bail lid, the jar features a large mouth and concave neck that makes filling and storing preserves with ease, so you don't have to worry about spilling sauces or pickled vegetables after the jar is opened. The bright, clear glass beautifully displays the contents inside, and the wide lid allows easy stacking for storage. Wire-bail lid makes this fantastic for a short-term storage option Built for quality, the Super Jar uses the iconic wire bail and the often imitated, but never duplicated, famous orange rubber seal, so you can feel good in your preservation. This system keeps the contents air tight, which means a long-term shelf life. For general storing, it opens easily and closes tightly, keeping contents secure. Le Parfait gaskets cannot be reused for heat treating. 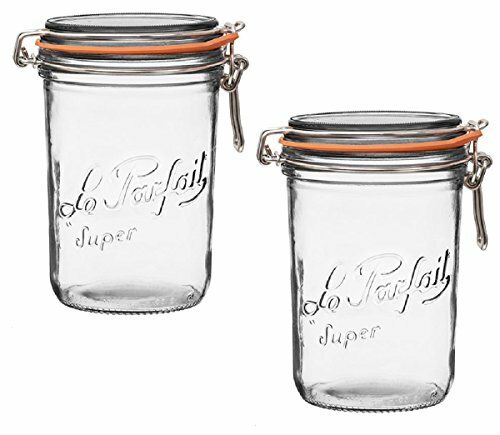 Displaying or storing gaskets on Le Parfait jars may damage them for canning purposes. Jars are shipped with a paper seal and the gaskets inside for their protection. Its clean design will have you using it every day The Super Jar's shape and sizes are good for soups or sauces, cut and whole pickles and vegetables, crushed tomatoes and fruits, olives, salsas, baby food, seeds and nuts, spice and salt mixes, compound butters, ground or whole bean coffee. The jar's design also makes it a decorative element for non-canning needs. Use it as a gift container for sweets and nuts or a base for candles. With the solid, easy construction of a hinged, bail lid, the jar features a large mouth and concave neck that makes filling and storing preserves with ease, so you don't have to worry about spilling sauces or pickled vegetables after the jar is opened. The jar's design also makes it a decorative element for non-canning needs. Use it as a gift container for sweets and nuts or a base for candles. If you have any questions about this product by Le Parfait, contact us by completing and submitting the form below. If you are looking for a specif part number, please include it with your message.